Opsis designed the new 46,000 sf Academic Building as an advanced technology classroom building that formalizes an important campus entry. 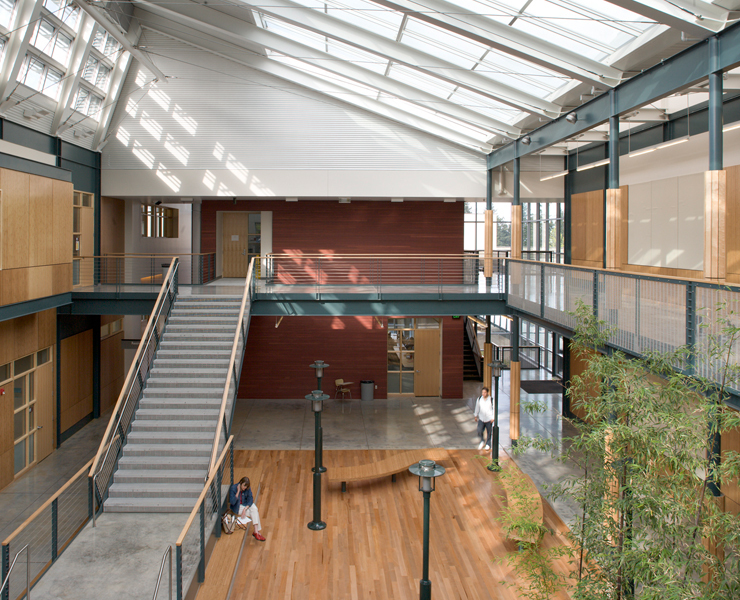 An internal winter garden organizes the building along an east-west axis while creating an inviting path to classrooms and the campus beyond. The $9 million facility houses the Distance Education Program, the Computer Technology Labs and offices and 11 general-purpose classrooms. The recording studios and production facilities are set into the hillside in the lowest level. The computer technology and networking labs face north to take advantage of diffuse daylight. South facing offices and classrooms use sunshades and light shelves to bring daylight deep into the room while framing views beyond. The unique wintergarden creates a year-round tempered gathering space. This space is warmed in the winter by sunlight, while a portion of the return air ordinarily exhausted to the exterior from the conditioned classrooms at the perimeter will be harnessed to provide the space with partially conditioned air without consuming additional energy. Passive ventilation and carefully oriented glazing keeps summer temperatures within a few degrees of ambient.